Accidents involving tractor trailers, 18-wheelers, and other heavy trucks can change victims’ lives in the blink of an eye. The tragedy of these accidents is worsened by the fact that, in many cases, they can – and should – be avoided. If you have been injured or lost a loved one in a commercial truck accident, it is critical that you speak with an experienced attorney about protecting your legal rights. If the trucker, the trucking company, or someone else is to blame for what happened, you could have a claim for significant financial compensation. When Can You Seek Financial Compensation After a Truck Accident? Alcohol Impairment – The dangers of driving under the influence of alcohol are amplified when the drunk driver is behind the wheel of a semi truck or tractor trailer. Drug Impairment – Abuse of illegal, prescription, and over-the-counter drugs is a known issue among many truck drivers. Distracted Driving – Distracted driving is an all-too-common problem as well. Truck drivers who are texting, calling dispatch, or watching movies on their mobile devices put themselves and others in serious danger. Driver Fatigue and Falling Asleep Behind the Wheel – Fatigue is another common problem among many truck drivers. Truckers who log long hours put themselves at risk for falling asleep behind the wheel. Driver Inexperience or Lack of Training – Driving a heavy commercial truck is not easy. It takes specific training and experience. Truck drivers who are not equipped to respond to dangerous situations will often be to blame when accidents occur. Speeding (Including Driving Too Fast for Weather or Road Conditions) – When a truck driver is speeding, his or her stopping distance increases substantially, and his or her ability to maneuver in an emergency situation is greatly reduced. Failure to Check Blind Spots – Sideswipes and merging accidents are commonly the result of a truck driver failing to check his or her blind spots. Other Forms of Driver Negligence – There are numerous other forms of truck driver error that can lead to accidents as well. Learn about some other examples of common truck driver errors. Who's Responsible for Your Truck Accident Injuries? Once you know what happened, then you can determine who is responsible for your injuries. In a typical accident resulting from truck driver negligence, it will be the truck driver and his or her employer (employers are generally liable for the on-the-job acts of their employees). If a truck defect (like faulty brakes) caused the accident, the truck manufacturer and dealership could be responsible. 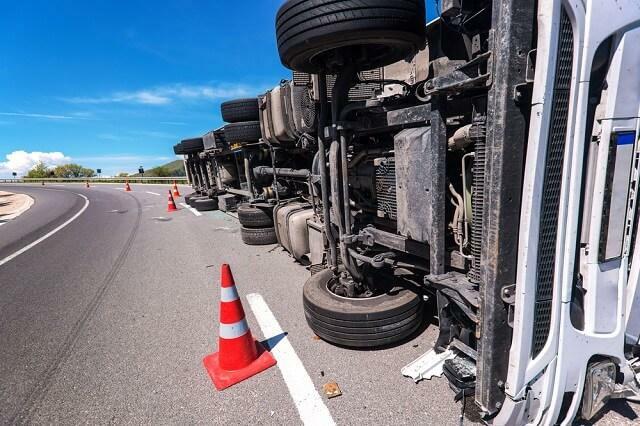 In other situations, trucking companies, shipping companies, maintenance and repair shops, and even certain government agencies can all face liability for victims’ truck accident injuries and losses. Learn more in: Who is Responsible for Losses Due to Trucking Accidents? The rate of truck accidents resulting in injuries has increased each year since 2009. The latest data show that we are currently seeing the highest rate of truck accidents we’ve seen in a decade. Over the most-recent five-year reporting period, truck accidents resulting in injuries have increased by 55 percent. In the latest year for which data are available, the Federal Motor Carrier Safety Administration (FMCSA) reports that truck accidents resulting injuries increased by 21 percent, from 73,000 to 88,000 accidents. Despite these significant increases in the number of injurious truck accidents, the number of vehicle miles traveled by large trucks has increased by just 1.5 percent. This means that the increase in accidents is not solely attributable to there being more trucks on the road. While fatal truck accident figures have dropped significantly from 10 years ago, they started climbing again in 2011. These are alarming statistics, and ones that could very well get worse before they get better. Despite these data suggesting that truck accidents are on the rise, Congress has recently pursued a number of legislative changes designed to increase the number of hours truck drivers can spend behind the wheel and eliminate a requirement for truck drivers to take a significant break between weekly shifts. These proposed changes come at the behest of the trucking companies, which claim that the changes are necessary in order to support a growing shipping industry. However, as noted above, the rate of increase in accidents is already far outpacing the rate of increase in miles covered – even as safety technologies are improving. Different Kinds of Trucking Accidents – Learn about jackknifes, rollovers, and other common types of commercial truck accidents. Understanding Tractor-Trailer Jackknife Accidents – Find out exactly what happens when a truck driver loses control of a heavily loaded trailer. Rollover Truck Accidents in Georgia – Find out about the most common driver mistakes that lead to rollover accidents. Maintenance Problems Can Lead to Trucking Accidents – See six of the most common truck maintenance issues and find out who is responsible when these issues lead to dangerous accidents. Commercial Driver DUIs and Truck Accidents – Learn more about the dangers of drinking and using drugs behind the wheel. The Link Between Truck Accidents and Driver Fatigue – Just how dangerous is it for a truck driver to be drowsy behind the wheel? See some specific examples of the risks of truck driver fatigue. Semi-trucks and Blind Spots – Learn about commercial trucks’ “no zones” and truck drivers’ responsibility to watch for approaching vehicles. Personal Injury FAQs – Our FAQs provide important information for dealing with the insurance companies after a commercial truck accident in Georgia. For advice specific to your personal circumstances, we invite you to schedule an initial consultation with one of our experienced attorneys. The consultation is completely free, and we will be happy to answer any questions you may have about your claim. In addition, since our firm handles all truck accident cases on a contingency-fee basis, you never have to worry about legal fees. We only retain a portion of your award if we are successful in helping you secure financial compensation. Have You Been Injured or Lost a Loved One in a Truck Accident? Schedule a Free Consultation Today. To find out if you have a claim for a truck accident in Georgia, contact Van Sant Law LLC and request your free, no-obligation consultation. Call (404) 991-5950, send us a request online, or chat with a live representative now and get started on the road to recovery today.